Description: Carol Childs is in the middle of one of the biggest stories of her life. Her daughter Cate has returned from college with a boyfriend in tow. A photographer who police suspect to be The Model Slayer, responsible for the murder of three young women. Why I Picked This Book: I've enjoyed the previous books in the series and couldn't pass up a chance to see what Carol is up to now. My Impression: This is one of the most un-cozy cozies that I've read in awhile and I mean that in the best way possible. Carol is an amateur detective but she's also a very solid journalist with a long career behind her. I really enjoy that the author pulls real life dilemmas and blends them into the story - in this case it's how far do you go to protect a source and at what point are you too personally involved with a case. She's ambitious, a hard worker, and doesn't hesitate to do everything she can to sniff out just what is really happening around her. This mystery flew by. I really enjoy a serial killer mystery but they can frequently get a little too disturbing for me. This had everything I like but never got to graphic or disturbing. It was definitely best of both words - cozy and thriller - for me! 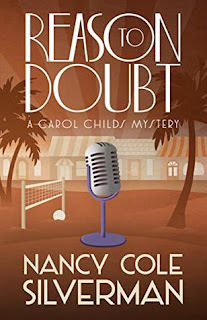 Normally, I spend some time trying to guess the who and the why but here I was just so much enjoying Carol's investigation that I felt like I didn't want to get ahead of her! I was also happy to see Chase and Misty back as well as more fun with Carol's boss Tyler. He can be such a weasel but can also come through in a tight spot just when you need him. My main issue was that Carol's daughter drove me crazy! I get that she's in an uncomfortable situation and is very angry but the lashing out at Carol seemed almost immature at times. This is the kind of behavior I would expect from a 14 year old - not a college student. However, that's just through my own experience and it never impacted my enjoyment of the mystery. If you enjoy page turning not so cozy cozies this is a series that you must not miss! This just might be my favorite yet! Would I Read More of this Series/Author? Absolutely! I'm looking forward to seeing more about Carol Childs' adventures. Would I Recommend this Book? Definitely! This is a fun read with a solid mystery. You might like to read it. I haven't read any of her books yet (bad Kay), but I have a couple of them. Glad to know that they work so well for you. Hey, Kay. Small world. Hope to see you at Malice again next year. And thank you for the shoutout about Junglereds. Hi Nancy! Oh, I wish I could make it to Malice this next year, but my husband has a conference in Colorado that I'm tagging along. It's at the Broadmoor and we've never been there. Ha! Anyway, I'm hoping to go to Left Coast in San Diego in 2020. Maybe you'll be there? Congrats on the new book! This sounds good, and I am glad you've been enjoying the series. I love the cover. I've been really curious about the series--and now I'm tempted to add it to my list. I like the idea of a not-so-cozy cozy. I will have to keep this one in mind. This does sound very inviting - or you make it seem so. I like the journalism side of it. I know I hate serial murders too, but all the J. D. Robb books have lots of serial murders and I seem to cope! Thank you for an excellent review, Katherine! I like the sound of this one. I enjoy those types of dilemmas - but I do find the current fashion for gore and violence in thrillers very disturbing. So this one sounds as if I'd really enjoy it.